While this new technology is nice and helps you with your driving, keeping the sensors clean during the winter months is important. Here are some of the safety sensors that may be on your car. 1. Forward Collision Warning System (FCW). Car manufacturers have done a nice job installing the sensors, so it may take you a couple of strolls around your car to find them. FCW checks the road in front of you and is designed to warn you if a car in front of you is traveling at a slower speed or has stopped. If this is the case, the system may send you a variety of warnings, such as sounds, visuals, vibrations, or a brake pulse. Because these sensors may be located in the grille or front bumper, they can become blocked by snow, ice, or dirt quickly and easily. When removing snow from your car, don’t forget about these sensors. 2. Adaptive Cruise Control. This system automatically adjusts your speed if you approach a car that is traveling slower than you are. This system may use radars that are mounted in your grille and an in-vehicle camera. 3. Blind-Spot Monitoring System. This system warns you of cars or motorcycles that are hidden from you i.e. in your blind spot. In the good ole days, blind spot mirrors where used to help with this. Today, this system alerts you by sound, visualization, or vibration. In my car, the outside mirrors light up with an orange color. The radars for this system are usually found in your car’s rear quarter panels. While this part of the car doesn’t get as dirty as the front and rear, it is important to be mindful of where they’re located. Blind-spot monitoring systems work best at highway speeds and should not be relied on 100% of the time. Before making a lane change, it’s still important to look over your shoulder. 4. Rear Camera. The rear camera is a wonderful set of extra eyes. This safety device helps you see directly behind your car. It doesn’t allow you to see pedestrians or traffic moving from side to side. This winter, I’m constantly cleaning the camera because of road spray. On my car, the camera is slightly above the license plate on my tailgate. 5. Back-up Warning/Rear Cross Traffic Alert. 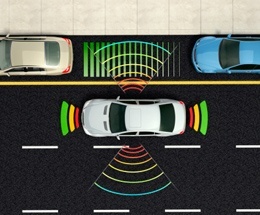 These sensors provide an audible alert as you get close to things or as rear cross traffic approaches your car. The closer an object, the faster the alert sounds. These sensors are in usually in your car’s rear bumper. 6. The Windshield. Cameras and other technology such as automatic windshield wiper sensors may be built into the glass. Make sure your entire windshield is clear of snow and ice. The little peep hole that some motorists use is not sufficient for safe driving. If your car has this technology, a regular car wash can help keep it free and clear of snow, ice, and road spray. If the temperature is too cold, a small damp cloth may do the trick. Please be mindful that road spray may contain salt and sand, which can scratch your paint. If you have difficulty finding the sensors on your car, please refer to your owner’s manual or give your local car dealership a call. Finally, never rely fully on your safety sensors. Always use your eyes to keep track of what’s happening around your vehicle.